Wireless Play: Removing troubles of a wired connection, through the wireless connection and transmission, the user can enjoy a high fidelity music at any place indoor by wireless control. No Aux port, still can play your favorite music from your phone to car stereo audio system! 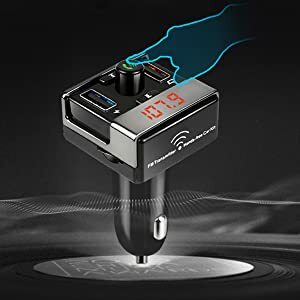 iSunnao Bluetooth 4.1 FM Transmitter with handsfree car kit gives you the ability to play your favorite songs from your cell phones to car stereo wirelessly. It also features the handsfree car kit to give you the ability to talk freely while driving. With supporting WMA and MP3 format, you may play your favorite audio files in micro SD cards or USB Disks on iSunnao Bluetooth 4.1 FM Transmitters. It also features phone APP control so that you may easily control your songs via APP. Grab one now to stream your music to your car stereo and talk on your phone freely! iSunnao Bluetooth Car Adapter FM Transmitter MP3 Player features the ability to play your favorite music via iPhone, iPod, or Micro SD Car. At the same time, it offers you 3 charging options. It gives the option of charging two USB devices simultaneously with up to 5V/2.1A. With the intelligent charging technology, it maximizes the charging ability and shortens the charging time. In addition, the light port gives you the option to charge a third device. Simply connect your smartphone to iSunnao FM Transmitter through Bluetooth. Then select an empty channel on FM Transmitter and tune your radio to the same channel. With the handsfree function, this Bluetooth Car Kit allow you to focus on driving while on the road. Simply pair and connect to your mobile phone. Once it is connected, you can call, answer, and redial the call with this car kit. Once you receive a call, the voice prompts you with the phone number automatically. It also has the CVC technology built-in to help reduce the echo or noise during the call. iSunnao Bluetooth Car Kit FM Transmitter features the ability to play your favorite music from iPhone, iPod, or U Disk to a car stereo system. With EQ Function, it allows you to choose Normal / Pop / Rock / Jazz / Classical/ Country. With the output of 5V/2.1A, 5V/1A, and 5V/2.1A, It gives the option of charging Three USB devices simultaneously. With the intelligent charging technology, it maximizes the charging ability and shortens the charging time. Simply connect your smartphone to iSunnao FM Transmitter through Bluetooth. Then select an empty channel on FM Transmitter and tune your radio to the same channel. You can also play your favorite music from U-Disk. Simply insert U-Disk into FM Transmitter, it automatically searches for MP3 file and play automatically. With the handsfree function, Bluetooth Car Kit allows you to focus on driving while on the road. Simply pair and connect to your mobile phone. Once it is connected, you can call, answer, and redial the call with this car kit. It also has the CVC technology built-in to help reduce the echo or noise during the call. iSunnao BT Media Remote provides you with the ability to access your smartphone or tablet while it is in your pocket, purse or from your couch. Attaching the media button to the dashboard, handlebar or steering wheel to conveniently and safely control media function when your smartphone is out of reach. Play/pause, forward/backtrack, and adjust volume even while your phone is in your pocket, purse, plugged into the wall, or elsewhere up to 40 feet away! The Secret of Playing Music from Your Phone to Car Stereo Audio System without Aux Port. iSunnao Wireless FM Transmitter Bluetooth Car Kit gives you the ability to play your music from the FM empty channel in your car. 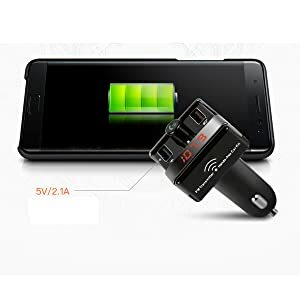 To connect your smartphone to FM Transmitter, simply power on the FM transmitter, and find it on the Bluetooth setting in your smartphone. Once it is connected, select an empty channel on FM Transmitter and tune your radio to the same channel, then play your music from your smartphone to your car audio system. It also plays MP3 music from TF card. Simply you can put your favorite songs on the TF card and play through car stereo system. It features USB Charging port with output voltage of 5V DC 2A to charge your iPhone/iPad/tablet/and other smartphones when you enjoy your driving. This Bluetooth Car Kit Offers you the ability to play the music/audio in four different ways. Not only you connect it to the FM radio, but also you can connect to your car stereo system via AUX port. In addition, you may store your favorite audio files in TF Cards or U-Disks. iSunnao Bluetooth Car Adapter automatically detects 4 different audio formats, including MP3, WAV, WMA, and FLAC, then play automatically. Audio Format: MP3 WMA WAV FLA. This car kit also features the handsfree function to allow you to focus on driving while on the road. Simply pair and connect with your mobile phone. Once it is connected, you can call, answer, and redial the call with this car kit. Once you receive a call, the voice prompts you with the phone number automatically. It also has the CVC technology built-in to help reduce the echo or noise during the call. It supports one USB charger port (the left USB Port). For charging the phone and other digital products, support the output 5V/2.5 A (Max). Quick Charging Technology can charge your favorite mobile devices fast. With the intelligent technology, it recognizes Android, iPhone or other Mobile devices to automatically adjust the output power to the different smartphone.